The Trevi is probably the most sophisticated looking bag from Louis Vuitton. The Trevi’s design combines the classic Damier canvas and pleats to subtly contrast its rounded, generous look. It comes in two sizes, PM (13.4″ x 9.4″ x 5.9″) and GM (16.1″ x 11.8″ x 7.9″) and is only available in Damier canvas. There have been reports that a Monogram canvas version of the Trevi is in the works, however it should remain very much in the rumor category for now until there’s a final confirmation from Louis Vuitton. The Trevi has smooth leather handles, straps and trimmings which is very comfortable to carry handheld or in the shoulder. The leather straps are adjustable and removable making the Trevi a very versatile bag. It’s golden brass pieces also serves as accents which makes the bag more visually appealing. The inside is very spacious, it has internal patch pocket and cell phone compartment and is lined with high quality red microfiber. The bottom of the Trevi has base studs for extra protection against dreadful surface scratches. Random Fact: Did you know that the Trevi is named after the famous fountain in Rome called Fontana di Trevi which is the most ambitious of the Baroque fountains of Rome? Now you know! There have been concerns that the Trevi’s zipper is extremely stiff and the opening doesn’t open up that much. My advice is that use candle to wax the zipper so that it would be more easier to open and close, it’s safe and it won’t damage your article. As for the opening, it’s really not that much of a problem. It’s part of the Trevi’s beauty! I’d say that the Trevi is definitely worth it. It’s a worry-free bag. No vachetta to think aboutand it’s absolutely gorgeous! The Trevi PM costs $1,590, and the GM costs $1,940. 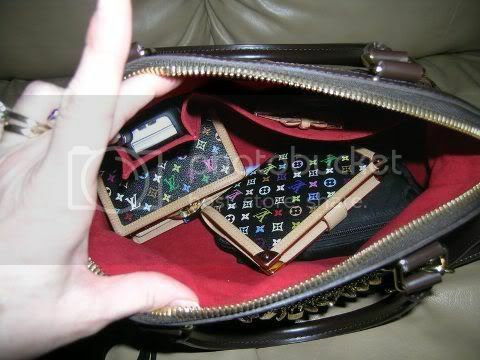 They’re available online at eLuxury and offline at your favorite Louis Vuitton boutique. If you want to see more photos of the Trevi, there are tons after the jump!